Shilkret, best known as a conductor of “pops” concerts on the radio, had engaged Aleksander Tansman (Adam and Eve), Darius Milhaud (Cain and Abel), Mario Castelnuovo-Tedesco (Noah’s Ark), Igor Stravinsky (Babel), Ernst Toch (The Covenant), and wrote one section himself (Creation). Neighbour’s formal description seems incorrect, since there are only four entries of the subject (or its inversion functioning as a fugal answer) before the stretto sections. The work consists of an introduction, a fugato, and a coda. As to the significance of the choral passage, Peter Gradenwitz speculates the following, “[the] chorus—symboliz[es] the appearance of man.” 5 The work, written in the twelve-tone style, ends on octave Cs, suggesting form out of chaos, similar to the music accompanying the exaltation “and there was light” at the end of “The Representation of Chaos” in Haydn’s The Creation. 1 Leonard Stein, preface to Prelude, op. 44, by Arnold Schoenberg (Los Angeles, CA: Belmont, 1945, renewed 1973), [ii]. 2 O[liver] W[ray] Neighbour, “Schoenberg, Arnold,” in Grove Music Online, ed. Laura Macy, http://www.grovemusic.com (accessed 9 May 2007). 3 Leonard Stein, preface to Prelude, op. 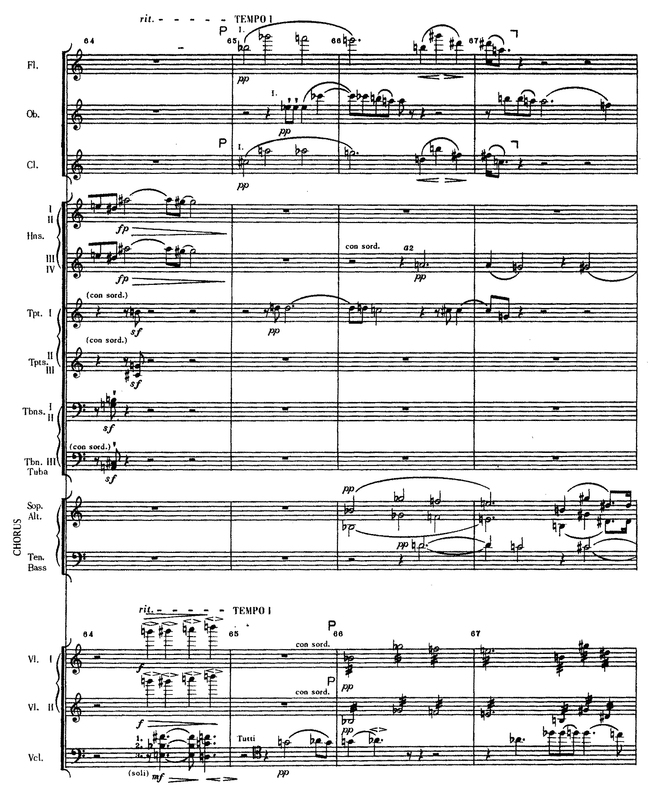 44, by Arnold Schoenberg, [ii]. 4 Arnold Schoenberg, Prelude, op. 44, 21. 5 Peter Gradenwitz, “The Religious Works of Arnold Schönberg,” Music Review 21 (1960): 24. 6 Arnold Schoenberg, Prelude, op. 44, 28.